The beauty of the Smoky Mountains is not lost when the sun sets over the peaks. After dark, the stars come out to play in a stunning visual symphony. After dark, the galaxy’s true vastness finally comes into plain view. Aside from the sheer beauty, stargazing is a great way to create lasting family memories, on a very minimal budget. Life doesn’t really get any sweeter than snuggling in camp chairs with some hot cocoa under the brightly speckled night sky. If you bring a telescope, you can even pinpoint specific constellations! These printable constellation cards can help you in your search. Unfortunately, even when you’re in the middle of nowhere, stargazing can be affected by residual light from neighboring towns. 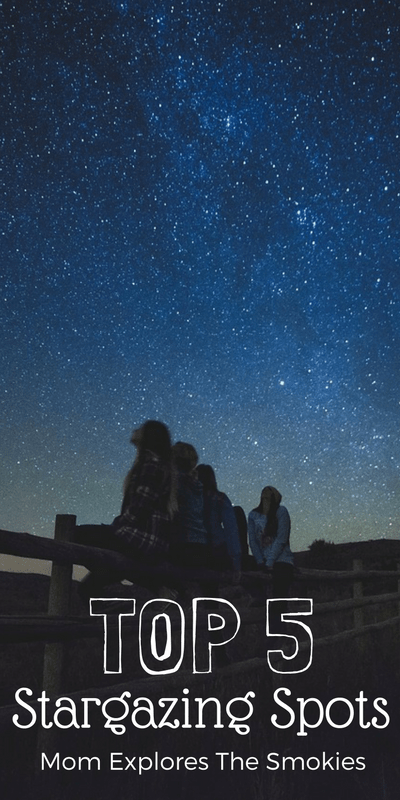 If you stick to this list of the top 5 stargazing locations in (and around) the Smoky Mountains, you are sure to have an amazing family experience with minimal interference. If you need additional stargazing tips and information, please visit the Smoky Mountain Astronomical Society. They even host periodic stargazing parties. How fun! Foothills Parkway – During the day, foothills parkway is a scenic Smoky Mountain driving route stretching south from Walland, TN. The overlook best for stargazing is located at Look Rock on Chilhowee Mountain. Coming from Walland, it will be the 1st overlook on the left after passing the Happy Valley Road intersection. This location has designated parking, but no facilities. Periodic stargazing parties are held at this location. Clingman’s Dome – Although this location does not offer total darkness, the looming height of this peak makes it a popular destination for stargazers. There is a large parking lot with facilities and, of course, the world famous dome tower at the very peak of the mountain. Newfound Gap – This overlook, along the Appalachian Trail, straddles Tennessee and North Carolina. Here, you really can be in two places at once! During the day, this location offers sweeping mountain views. At night, the galaxy is the star attraction (see what I did there?). There is designated parking and restroom facilities at this location. Unicoi Crest on the Cherohala Skyway – During the day, Cherohala skyway is a beautiful scenic driving route. Although not actually in the Great Smoky Mountains, this location is very close by in the neighboring Cherokee National Forest. The overlook is situated just over the TN border into Robbinsville, NC. There is a designated parking lot, but no facilities. Periodic stargazing parties are held at this location. Cades Cove – This popular park attraction is known for its bears and kid-friendly living history exhibit. It is also an excellent location for stargazing, with designated parking and restroom facilities. Periodic stargazing parties are also held at this location.